Around here (for definitions of “here” that include Ohio), storms involve water. Usually rain and thunder. This time of year, a side of tornado is common, and in the spring we’ll often get a side of flooding. In the winter, snow and/or ice may replace the rain and thunder, or we may get rain by itself. Occasionally, there will be hail. There will always be water, and most people have learned to deal with that. Hurricane Ike decided not to pay attention to any of that. We got wind, with a side of wind and gusts of more wind, but almost no rain. This was good and bad. Good, because most people’s sump pumps weren’t working. Bad, because the reason the sump pumps weren’t working was because much of the city was without power. We lost power sometime around 2:30 or so on Sunday afternoon. It came back about 1:30 Monday afternoon. We were some of the lucky ones – there’s a sewage pump at the bottom of our street, so we were high priority despite being a residential cul-de-sac. My parents didn’t get power back until Tuesday evening, and my co-worker doesn’t expect power back until Saturday morning at the earliest. Lack of electricity has quite hindered my stitching time, even though most of my projects are handwork. You see, it’s football season, and during football season, I’ll put the game on in the background for three or six hours of serious stitching time. No electricity means no football games to ignore. Now that power is back, I have to catch up on laundry and other housework that usually gets done on Sunday afternoons. We still have close to a cord of long, skinny branches to cut into short skinny branches for burning. This is after cutting the larger branches into logs, and cutting at least a quarter of the small branches down to a size that will fit into our burn barrel. And the leaves need to be raked, and the grass needs to be mowed, and the steps and the deck need to be swept, leaving little time and less energy for stitching. 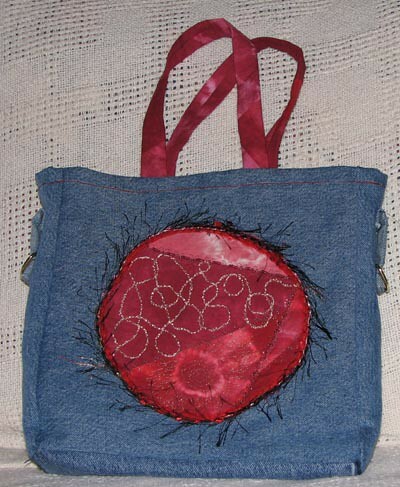 My denim purse is close enough to completion that I have been using it occassionally. I decided to put it on the September list back on August 29. At that time, the bag was still in two parts – the denim outer and the cotton lining. It had no handles, and no shoulder strap. It had a place to attach a shoulder strap, but I wasn’t sure if it would get handles at all. By the end of the day on August 30, handles had been made and attached, the lining and bag had been stitched together, and the hole I left to turn the bag right side out had been stitched closed. On the 31st, I finished the topstitching around the top edge. I still need to attach the shoulder strap, but I seem to have mislaid it in my latest sewing room reorganization. I’ve considered adding some trim over the topstitching, but I rather like the way it currently looks. I should have no problems getting this one finished by the end of the month. This entry was posted on September 17, 2008 at 9:43 pm and is filed under UFOs. You can follow any responses to this entry through the RSS 2.0 feed. You can leave a response, or trackback from your own site.